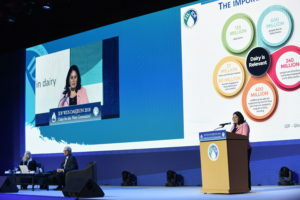 Advancing the interests of the global dairy sector by being at the forefront of scientific knowledge and expertise on issues and challenges impacting on the growth and sustainability of this major economic sector is the value the International Dairy Federation (IDF) brings to its members. IDF Director General Caroline Emond drove home this point to delegates at the World Dairy Summit 2018. She said IDF’s global advocacy for dairy development through interventions at international policy-making platforms and contributions in the drafting of standards, guidelines and policy reforms help to make a difference. She stated that the advisory role of the IDF at such fora has been strengthened by its strong foundation in science-based knowledge of dairy and insight on best practices. “IDFs activities from farm to fork help underpin the integrity of the dairy sector ensuring it is recognised as a responsible industry and continues to have a licence to operate, and to deliver safe and sustainable dairy products to consumers,” said Ms Emond. IDF has a worldwide network of 1,200 multidisciplinary experts working in 17 Standing Committees and 3 Task Forces providing science-based expertise and a wealth of knowledge and skills on tap. On the strength of this global talent pool, Ms Emond said IDF is the leading voice of dairy to intergovernmental organizations, building global consensus and common ground. With 41-member countries representing two-thirds of global milk production, IDF is a force to be reckoned with, said Ms Emond. Contributions to the global economy by the dairy sector is significant, according to Ms Emond, with dairy producing 27% to the global value-added from livestock. The global dairy expertise of the IDF is unsurpassed, stressed Ms Emond. IDF, she said, is a trusted partner of international organisations in the setting of standards. She said the Codex Alimentarius Commission has requested IDF to review guidelines by the FAO/WHO Joint Expert Meetings on Nutrition (JEMNU) for the establishment of nitrogen to protein conversion factors for soy and milk proteins. IDF guide and publications, Ms Emond said, serve as useful reference for the dairy sector as well as for international organisations. 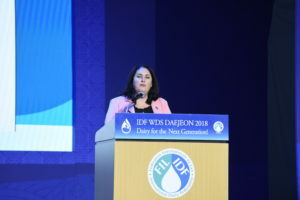 Building on its reputation for over a century, the IDF Director-General said the organisation continues to grow from strength to strength, providing vital information impacting on dairy sector development and its prospects for growth. “In the era of fake news, heightened activism championing alternatives to dairy based on ignorance, it is all the more important to share your voice in IDF as we’re stronger together in championing the role of dairy in nourishing lives,” she concluded.